I've written many times in this blog about the remarkable career of Dr. John Rae. His achievements place him in the first rank of Arctic explorers, and yet for much of the past century, his name had not been listed among them. He had the misfortune to be the bearer of bad news -- that some of Sir John Franklin's men had resorted to cannibalism, which Rae called "the last extremity" -- and to defend his Inuit friends and contacts for their veracity against a lengthy diatribe by, of all people, Charles Dickens. Although officialy awarded the reward for ascertaining the fate of Franklin he was shunned by many of his contemporaries. 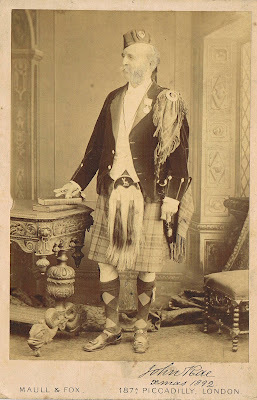 Never the less, Rae never became a bitter man, and throughout the remainder of his life he never expressed anything but admiration for Sir John Franklin, and pity for the terrible fate faced by the last survivors of his expedition. I'm very happy to note that things have changed considerably in recent years. Ken McGoogan's book Fatal Passage (2001) led the way, followed by John Walker's extraordinary documentary adaptation Passage (2008). In 2014, acting at the request of MP Alistair Carmichael, and based on documents submitted by supporters of Rae (including a letter of mine), the Dean and Chapter of Westminster Abbey approved a memorial to Dr. Rae, to be placed in the Abbey immediately in front of Frankin's cenotaph, and in his 201st birthday (30 September 2014) it was installed and dedicated. By honoring Rae this memorial honored many -- including the countless Scots who so often served with high distinction in the Arctic. And, at the same time, it spoke to the spirit of friendship that was so strong between Rae and the Inuit among whom he lived and worked. There remains more to be done. The John Rae Society, which was able to obtain title to the Hall of Clestrain, Rae's birthplace and ancestral home, is seeking begin work to stabilize and eventually restore the building. This May, I'll be traveling to Stromness and Kirkwall, along with novelist (and Rae's great-great- grand-niece) Jane Hamilton, to help raise awareness (and funds) for the further restoration of the Hall at the 2017 John Rae Festival. We'll also be launching Ms. Hamilton's novel Finding John Rae (the title's similarity to my own was a complete (though happy) coincidence that she and I discovered only after the fact!). You can read more about these events here, and download a complete schedule here. I hope that a great many people will be able to attend one or more of these events, and that their effect will be to motivate and mobilize those who feel the same kind of admiration for Dr. Rae and what he represents as do I. If you can't attend personally, bear in mind that membership in the Society will support their work as well, and members will also receive a regular News Letter with the most current account of its efforts to gain recognition for Rae's achievements and the preservation of his home. A membership form can be downloaded online, and the Society welcomes members from around the world. And so today let all of us, wherever we may be, pause a moment and recall the singular admixture, the rare alloy of character and skill, out of which Dr. John Rae's achievements were wrought. All who visit this blog likely know of more than one ship that was wrecked or abandoned in the Arctic -- Parry's HMS "Fury," the Rosses' "Victory," and -- perhaps best known of all -- HMS "Resolute," abandoned by Captain Henry Kellett, on orders from Sir Edward Belcher, on 28th April 1854. Kellett, as would be any captain, was extremely reluctant to follow this order, but in the end decided that duty required it. We know the other side of that story -- how the "Resolute" was found adrift in the David Straits, brought back to port by a whaling captain, and restored at US Government expense before being re-presented to Queen Victoria as a gift. That gift long accepted, and the time having come for the vessel to be broken up, the Queen gave orders that several desks should be made from her timbers -- the largest and most prominent of these being the "Resolute Desk" that has reposed for most of the past 50 years in the Oval Office of the White House as the desk of the President of the United States. But what exactly does it mean to "abandon" ship? The question takes on new interest following remarks by Dr. Martin Magne, recently retired as the director of archaeology and history for Parks Canada, and whose work has been instrumental in the discovery of Sir John Franklin's "Erebus" and "Terror," to the effect that the "Terror" may have been prepared for abandonment. According to an article about Magne's work in the Prince George Citizen, the vessel was "well-sealed in accordance with Admiralty instructions, which include sealing the doors with tar." This appears to have been a misstatement on their part -- when I reached out to Dr. Magne, he said that he'd merely spoken of this as something to look for, not something observed -- but it certainly got me started thinking. What exactly would the crew of an Arctic discovery vessel have done prior to an orderly abandonment? I have not yet been able to locate any specific printed instructions on the matter, but the example of "Resolute" seems a perfect precursor -- if "Terror" had been deliberately abandoned, surely the crew would have followed much the same procedure as did that of the "Resolute" just a few years later. As it happens, we have a fairly detailed record of Kellett's actions on that occasion. On the final evening aboard ship, as the sledges were being loaded for the crew and their provisions, a series of clearly anticipated procedures was followed. The pilot-jack -- letter "D" -- was hoisted at the foretopmast-head, and "the red ensign and pendant displayed, that in the event of her being obliged to 'knock under' to her icy antagonist, she might sink beneath the wave, as many a gallant predecessor had done, with colours flying." As a precaution, the signals books were burned, lest their contents fall into the wrong hands. A final dinner was also held, during which "the carpenters were employed caulking down the gun-room skylight and after companion." After that meal, Captain Kellett raised a glass of wine to the gallant ship, the decks were cleared, and the carpenter "secured" the main hatchway. So what did this caulking and securing consist of? "Caulking," in naval parlance, meant sealing up the cracks between planks, or -- in the case, one assumes -- sealing up the covers of hatchways and companionways. "Caulk" was tar -- the best sort was, and still is, "Stockholm Tar" -- and could also involve either oakum or marline coated with that same tar. The sealing of these parts of the ship both preserved the interior against intruders, animal or human, and increased the chance, should the ship ever be freed, of her not taking on water (the "Resolute," when found, did have some water in the hold, but this likely came from the lower timbers rather than the deck). 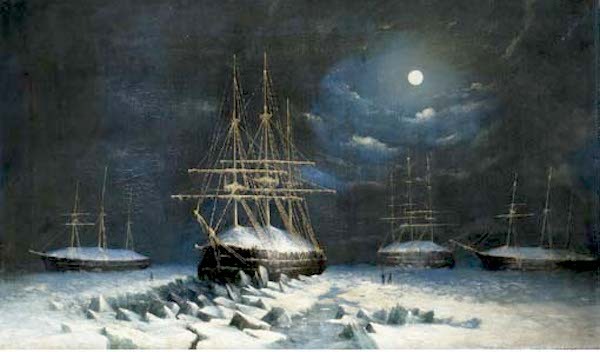 So if tar or tarring of hatchways and companionways was observed on HMS "Terror," it would imply that, at least to some extent, her abandonment was deliberate, and that the preparations were well along. This stands in contrast to Inuit account of a ship that sank suddenly, while its cargo was being unloaded, and taking some of those engaged in this work to the bottom. On the other hand, the sinking could have occurred in the midst of such a procedure, or on an occasion on which some later party had returned to the ship to retrieve supplies. Indeed, since we know from the Victory Point record that both vessels were temporarily "deserted" in 1848, it may well be that caulking would have been done then, and might be difficult to distinguish from similar work done later. The only way to know for certain, of course, will be when Parks Canada's archaeologists begin their work this coming summer. Hopefully, the well-preserved nature of HMS "Terror" will enable them to find clearer evidence one way or the other; no matter that, surely great things will be learned.